The Family & Learning Center would like to share an upcoming event with you. Carolyn Cowen, Ed.M, is an educator and social entrepreneur known for developing and managing programs and initiatives that improve the teaching-learning landscape for people with learning differences, particularly those with dyslexia. She earned her masters degree in reading education and learning disabilities from Harvard University. 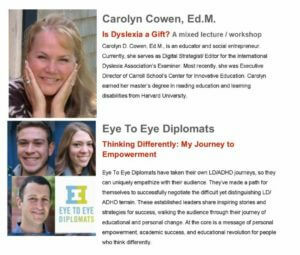 Eye To Eye Diplomats are established leaders, trained speakers who share inspiring stories and strategies for success, walking the audience through their journey of educational and personal change, providing a new understanding of LD/ADHD and learning itself. At the core is a message of personal empowerment, academic success, and educational revolution for people who think differently. Come prepared for honest, motivational discussions, and be ready to consider your own journey, both the paths you’ve followed already as well as the various paths from which you’ll create your future..